With one hour's notice, the fine folks at Ladys Island Marina in Beaufort, SC. found a spot for us... Little did they (or we, for that matter) know, that we would stay for a MONTH! You: But wait! Didn't you just spend two months in Charleston? You're supposed to be on your way to the Bahamas. Me: Well maybe not. But Bruce nearly mutinied when I "suggested" that he haul in the 100 ft of chain by hand. And since I need him too much to allow the mutiny to go forth, I relented and we pulled into the marina to see if we could get it going again. Maybe the predicted 40+ knot winds had a little bit to do with it, along with the corresponding temperature drop... but here we are. I'll try to make this as short and sweet as I can, but it's a long and convoluted (boring) tale, so it won't hurt my feelings if some of you drop out right here. I will tell you (spoiler alert!) that in the end, we got a nice shiny new windlass, it's installed and it works. So if you're still with me you have only yourself to blame..., here's how it went. Initially, the power button had been giving Bruce some problems. He would have to move his foot around to get it to make contact. Finally, it failed completely... So because of that, his initial diagnosis was that there was some corrosion causing the button to fail to make solid contact. He spent some time cleaning contacts but it didn't work. Testing the foot switch revealed that the switch was dead, so we ordered a new one. We paid $30 for overnight delivery, hoping to save the higher cost of another night in the marina. We found and ordered the RIGHT foot switch and (yes) paid the extra money to have it overnighted to us... (we're still hoping to get out of here and be on our way) The switch arrived and we installed and tested it. We hooked it up and the windlass ran. Once. The second time we pushed the button... nothing. Deader-than-a-doornail. WTF!??? Bruce tested the wires and confirmed that there WAS power going to the motor and finally in desperation, he banged on the motor with a mallet... IT WORKED! We can leave! No... we can NOT go out into the unknown with a windlass that may or may not require beating with a mallet to make it work. Lets get this done right while we're here in a welcoming place with knowledgeable people (with tools) around to help. We talked it over with the guys here and the consensus was to remove the motor and take it in to have it repaired... it was probably the brushes. If it couldn't be repaired, we could probably find a replacement somewhere local and we'd be good to go in no time. At this point, a little over a week had gone by. We rolled our stay into the monthly rate. 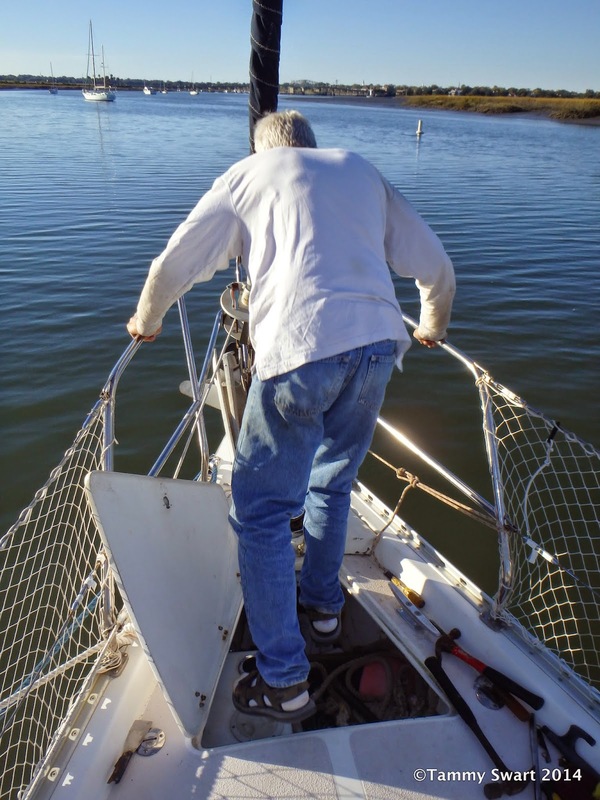 Bruce, after a phone call to Lewmar for dismounting instructions, went to work removing the motor that was mounted just beneath the windlass inside our anchor locker. Lewmar told him that if he just unbolted those four little bolts, the whole assembly would drop right down. (LIES!) Once the four nuts were removed from the bolts, nothing happened. Thinking that there must be some kind of sealant there, we started trying to pry it off using spatulas and chisels. We finally resorted to prying it with a crowbar... It. Would. Not. Budge. And now... pieces of the flange began to crumble and break off!!! Ok, but we STILL have to get the old windlass OUT! Once again, we consulted the guys around the marina. A VERY nice man named Dan came to our rescue. He brought out some bigger tools and he and Bruce went to work on trying to get the motor off. During all of this, I was struggling to keep from having a tiny meltdown. I remained belowdecks trying to pretend that this wasn't happening. 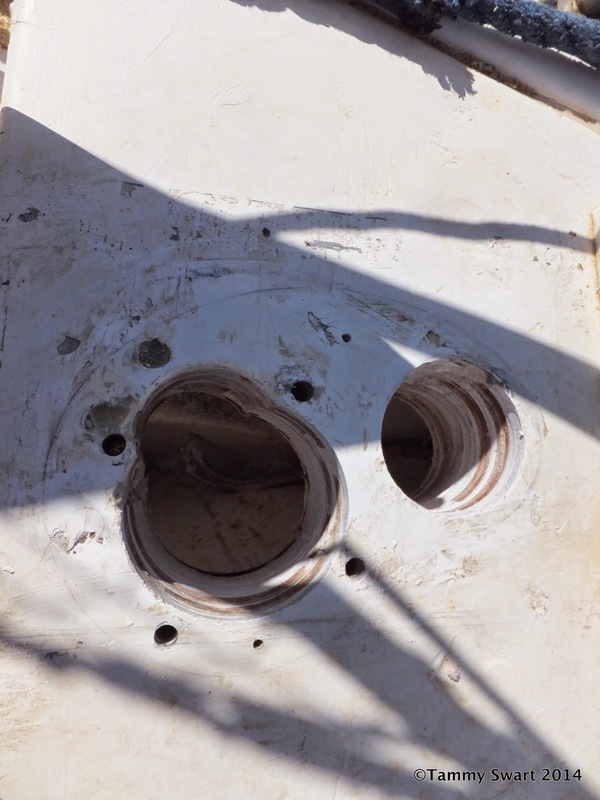 Unspeakable sounds came from the anchor locker. Sounds that were magnified and made twice as horrifying as they transmitted through the hull of my home. There was no need for me to be up there on deck putting in my two cents... I was useless. Evening came and the sounds ceased. I poked my head out and saw Dan leaving with the promise of returning in the morning with more tools. This is not good... 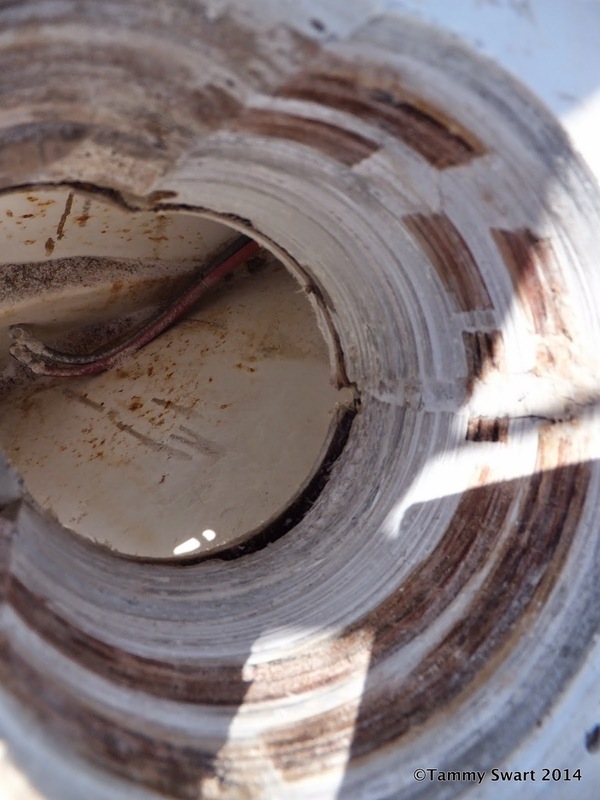 They had made some headway... but the main shaft going through the deck would not budge. We both felt very dejected but still thankful that we weren't in this alone. The next day arrived and Dan showed up, as promised, with more tools. He brought an air tank and power tools. And a huge drill. And a SAWZALL! He was going to use a sawzall on my precious boat!!! So, back down below deck I went while a repeat of the previous day happened all over again. Only this time, the ending was different. Near evening, Bruce came down with a big shiny beautiful piece of bronze in his hand. He brought it to show me that they had sawed through this thick shaft and finally got the motor to drop. The shaft was frozen inside the gear mechanism, which is why the motor was stuck. Knowing this... we are now more comfortable with our forced decision to replace the old windlass. And finally, thanks to Dan, the old one was free from our deck and we could carry on with ordering the new one. We said goodbye and many thanks to Dan, who would take no payment of any kind... and ended our day on a brighter note. We went to work looking for a new windlass. Optimally we would find one that would not require new holes in the deck. Lewmar has a drop-in replacement for our old windlass... Our recent experience with the scanty customer service skills of the Lewmar company had left us reluctant to buy another Lewmar product... but "drop-in" installation was a strong argument to go with them again. The other contender was the Maxwell RC 10-10. Both of these windlasses are size appropriate for our boat, that was the first step in our research for the perfect windlass. While doing our research and reading the specs for both windlasses, another unfortunate fact surfaced... Our anchor chain was type G3. The new windlasses were built for type G4 chain. What does this mean??? Is our chain not good enough? Is it going to fail? Are we in danger??? So down another road we went. We studied the chain types and the attributes for each... In the end, we could have got a Maxwell windless that would fit our old chain... but we decided that we would upgrade to the newer type chain, the G4 which is stronger size for size. Why stay with old technology going forward? If we're going to spend the money for a new windlass, why stay with the old chain? Ok so back to the windlass... The deciding factor ended up being the thickness of our deck. Our deck has a mounting pedestal on the bow which allows the chain to lead straight to the bow roller. The pedestal and the deck itself measure to a thickness of about 4 inches. The Lewmar wasn't built to accommodate that thickness. They DO offer a spacer, but when we called to place our order, they didn't actually HAVE any of them. It would be 2 to 4 weeks before they could get one... Strike three Lewmar... you're OUT! Here is where it gets a bit murky. Days passed and we made slow progress... The windlass arrived. Oh it is a thing of beauty. We studied the installation instructions meticulously. We didn't want to mess this up. We would be cutting enormous holes in our deck and we didn't want to do it twice! We had some days of inclement weather that delayed us more. We didn't want to open our deck to the rain and risk getting damp in the wood core. So we waited it out. Bruce serviced all of the OTHER winches on the boat. Another couple of days passed and finally the day arrived. The big guns were brought out in the form of a huge drill. We had purchased the two hole saw bits needed to drill the holes, but we were wary of the big drill. The guys had warned us that it packed a mean kick and could really do some damage if the user was unprepared. We were just about to start drilling when Dan showed up and volunteered to do the deed for us. OK, OK stop it! He was very knowledgeable and has used this bad boy before... we let him help us do it! I stood back and watched as the blade ate into inch after inch of our deck. Dan would stop and bring out a thick piece, then go at it again. Finally he made it through! The second, smaller, hole wasn't nearly as dramatic as watching that first one... Suddenly it was all over. Done! The thing we had been dreading all week was finished and we were free to proceed with the final phases of mounting the new windlass... if the holes were right. That's a LOT of deck! We had another few weather delay days. It was alternately cold and rainy and we needed to make sure that the hole was dry and sealed with epoxy before we finished. We applied epoxy over two days and finally we felt ready to mount the windlass. Will it go? Are the holes in the right place? We held our breath as we lowered the shiny new bit of boat-bling into the awaiting holes... It slid right in hand-in-glove. Ahhh we DID IT! We still needed to procure some backing plates for the bolts, but we hooked the motor up and hit the button... it worked! Eureka! Ah the sweet taste of success is ours! Bruce found some pieces of metal up in the marina shop to use as backing plates. We bolted the motor on and after repositioning it in several places, finally chose the one that would work best in our anchor locker, we were done. We hooked up the wiring again and applied some liquid electrical tape to the connectors... nothing left but the cleanup! This was a big project for us. We went from knowing next-to-nothing about our windlass. 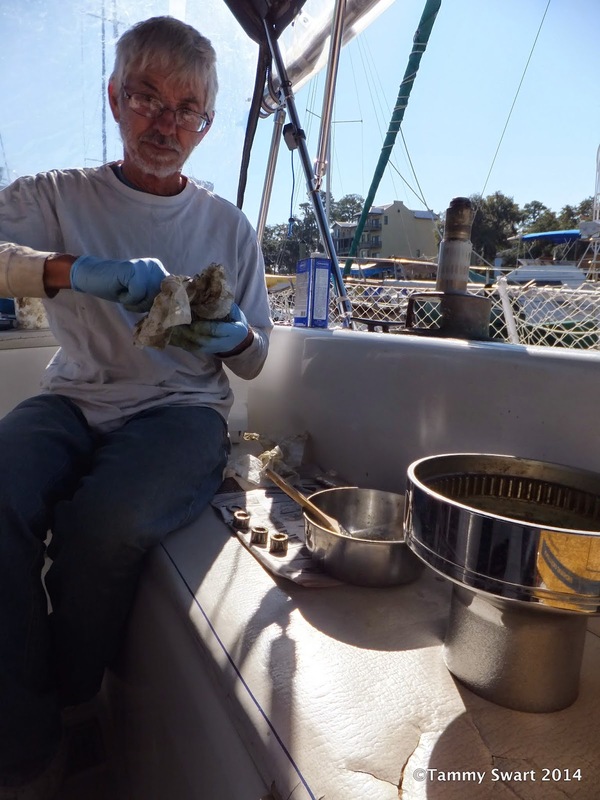 We had it serviced while the boat was out of water back in St. Petersburg last February, but other than that, we had no idea what it's maintenance needs were. Obviously that proved to be a problem. This new windlass has easy service instructions and easy access. It is a thing of beauty. We are happy in our choice and feel great about our level of familiarity with it. So here we are, nearing a month from the day we arrived here... Thanksgiving is tomorrow and we have a LOT to be thankful for. We are thankful that we were here in this place when our windlass chose to leave us. We are thankful for the people here at Ladys Island Marina, without whose help we would NOT have been able to get this done. We are thankful that Bruce and I have the opportunity to live this life of never-ending-surprises... But we are most thankful for our families who support us in our choices. Our Karma shines like a new windlass! We are in the process of dealing with a frozen propellor and the possibility of having to replace both (we're on a catamaran), ouch! So here's my question; what should we be doing to maintain our windlass? Because if that breaks down rest assured I'd have that melt down! Your upbeat attitude has made me feel a bit better about the crap that seems to happen every time I turn around. Laura and Hans, if you have the owners manual or can get one online, it should have some maintenance recommendations. Ours was older and no longer supported by the maker. We had no idea how to service the thing. Our new one came with a detailed instruction sheet showing exactly where we should grease it to keep it in smooth running order. It also suggested fresh water rinse for the gypsy. We will be adding this chore to our maintenance calendar for sure. Ouch is right. Sounds like you've got a bigger problem on your hands. I hope it turns out well and you don't end up replacing the engines. About the attitude... I really do mean it when I say we were lucky to have been in this place when this happened. It could have been a lot worse and we had only ourselves to blame for the condition our windlass was in. It was an expensive lesson but now we have a shiny new windlass and a thorough understanding of the machine. Thanks for reading our blog and for your comment/question. Cool Before It Was COOL?